Sooner or later your hot water heater will need to be replaced, if you are out of hot water or if your hot water heater is leaking and we receive a call before 12 pm, we will be able to schedule to install a new water heater the same day. If you are not in an emergency situation, in most cases we can still perform your installation the same day you contact us. If you are interested in a quote for a tank-less hot water heater, or an electric water heater, then we may schedule a time in advance in order to ensure that a qualified technician is available. Please feel free to print a coupon and present it to the service plumber at time of service. ASK ABOUT OUR LIFETIME GUARANTEE! In most cases we can repair your hot water heater as long as it’s not leaking, If you jumped in the shower to find the water not getting hot, we know exactly how frustrating that can be. We can most likely repair the hot water heater the same day. We often get calls for a new water heater and after we diagnose the problem, we do a simple repair and save our customers money. Give us a call and let us save you money today. Choosing an ENERGY STAR water heater can save you money over the lifespan of the water heater. Larger families save more due to the fact they use more hot water. You also want to check with your local Gas Company for any rebates they may offer. The gas company offers rebate programs a few times per year so be sure to take advantage of that. You can enhance you heater with a Hot Water recirculation pump that delivers hot water to the fixture as soon as you turn on the faucet. 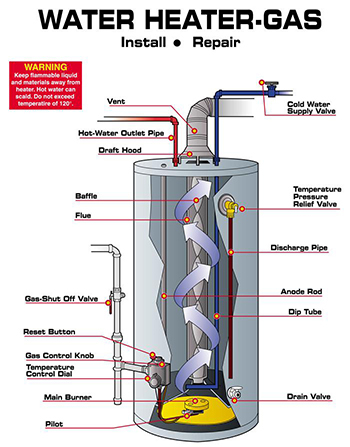 If your not sure what size water heater you need, give us a call or refer to our chart that will help you determine what size heater you have. Most customers don’t know that it’s not the size in gallons, it’s the size in B.T.U that is most important. A "B.T.U" is the amount of gas used to heat the water and how fast the recovery is. The higher the B.T.U the faster the water will heat. Find out the correct size of the heater you need... we can help! All water heaters have a Rating Plate that lists important data such as the model and serial numbers, manufacturing company's name, length of warranty, wattage of elements installed (on electric models), gallon capacity, input BTU rating (gas models), Learn more. Keep your Gas Water Heater in good operating condition by having it flushed and the anode rod inspected annually as the manufacture recommends. We offer a lifetime warranty on the water heaters we install and the only way we can do that is to flush it once a year and replace the anode rod when needed. We have water heaters on service agreements that have lasted over 30 years. 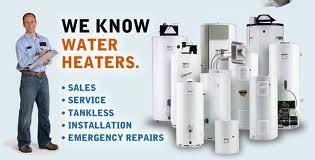 Most hot water heaters only last a year or two after the warranty.